Mangaluru, Mar 14, 2017: The long awaited hope and demand for a faster train journey between Bengaluru and Mangaluru will soon be realised with the South Western Railway (SWR) proposing to run ’Kudla Express’, the day train to be launched soon, on the newly laid Bengaluru-Hassan line. With this, the travel time between Bengaluru and Mangaluru will reduce by at least two hours, say SWR officials. This will bring the travel time down to nine hours. At present, it takes about 11 hours going via Arsikere (400 km) and 12 hours via Mysuru (450 km). Also, "Kudla" the ancient tulu name of Mangaluru is set to become more popular with this move of naming the new train "Kudla Express"
The Railway Board’s signal as well as indication of available dates of dignitaries to commence the service, which will begin as a tri-weekly service due to lack of rakes. The Yeshwantpur-Mangaluru Central service will run on Sunday, Tuesday and Thursday, leaving Bengaluru at 7 a.m. to reach Mangaluru at 4 p.m. The Mangaluru Central-Yeshwantpur service will run on Monday, Wednesday and Friday, leaving Mangaluru at 10.50 a.m. and reaching reach Yeshwantpur at 7.50 p.m., sources said. The service was announced as a daily via Mysuru by former Railway Minister D.V. Sadananda Gowda. Following a public interest writ petition by the Udupi Railway Yatri Sangha before the Karnataka High Court, the SWR had promised to start the service by March 31. The SWR has also proposed to make Mangaluru Junction the termination point of the Yeshwantpur-Karwar-Yeshwantpur tri-weekly (16515/516), given the low patronage between Mangaluru and Karwar. 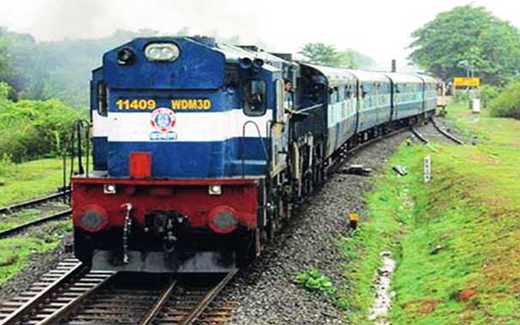 The Yeshwantpur-Karwar service leaves Yeshwantpur at 7 a.m. and reaches Mangaluru Junction at 5.40 p.m. on Monday, Wednesday and Friday, while the Karwar-Yeshwantpur service leaves Mangaluru Junction at 11.10 a.m. and reaches Yeshwantpur via Arsikere at 10 p.m. on Tuesday, Thursday and Saturday. Thus, passengers would get a day train facility on six days a week, SWR’s proposal says. Kukke Shree Subrahmanya-Mangalore Railway Commuters’ Forum organiser Sudarshan Puttur thanked MP Nalin Kumar Kateel and the SWR for considering the forum’s suggestion to route Kudla Express via the newly opened line. Hassan-Yeshwantpur Intercity : The zone has also proposed to run an intercity express and a DEMU passenger between Hassan and Yeshwantpur. The Hassan-Yeshwantpur Intercity will leave Hassan at 6.15 a.m. and reach Yeshwantpur at 9 a.m. On the return, the train will leave Yeshwantpur at 6.15 p.m. and reach Hassan at 9 p.m. The express trains will halt at Chikkabanawara, Nelamangala, Kunigal, Yediyur, BG Nagar, Shravanabelagola and Channarayapatna. The DEMU passenger will leave Yeshwantpur at 7.30 a.m. and reach Hassan at 10.30 a.m. The Hassan-Yeshwantpur DEMU will leave at noon and reach Yeshwantpur at 3.30 p.m., halting at all the stations en route. The name Kudla will become famous . As all these days the locals only were familiar . Now it will be known to all.